Amex offers are great for saving money and occasionally making money. It’s pretty simple to make money with Amex offers. All you do is buy gift cards with your Amex offer, then resell them. The best part about it is you can do it all from your house, which makes it very convenient. Check the current Amex offers available and find one that sells gift cards. Make sure the terms and conditions on the Amex offer do not exclude the purchase of gift cards. Some only exclude e-gift cards, which is fine. 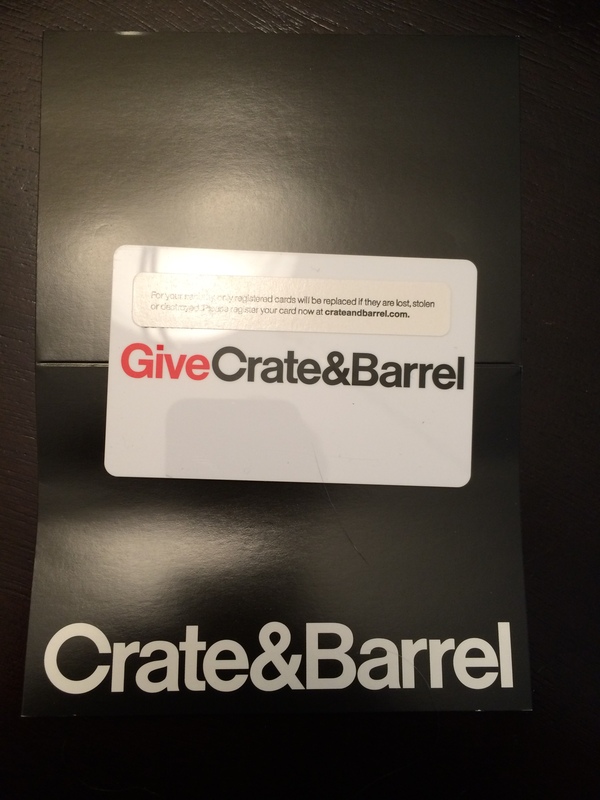 In this example, I used the $10 back at $50 Crate & Barrel offer. The terms explicitly excluded e-gift cards, but not plastic gift cards. To check if an offer is profitable, I refer to Gift Card Granny. They make it very quick and easy to check what a percentage I can get back on my gift card. In this case, Crate & Barrel gift cards are selling for 84% in cash and 88.2% in Amazon credit. Since the offer was for $10 back on a $50 purchase (20% off), either of those offers are worth it. I chose to sell it for Amazon credit, because I shop there for everything. Make sure to use the card where you saved the offer. Authorized user cards have different card numbers, so they have their own offers. 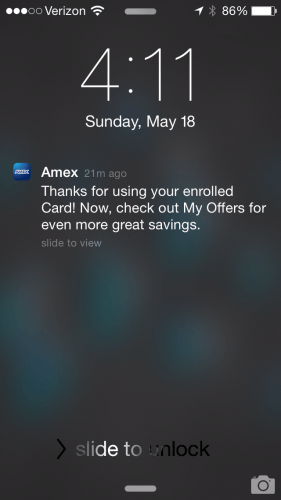 You can find more information about this on my Everything: Amex Offers post. More often than not, as soon as you make the gift card purchase Amex will notify you saying thanks for using Amex Offers (below). 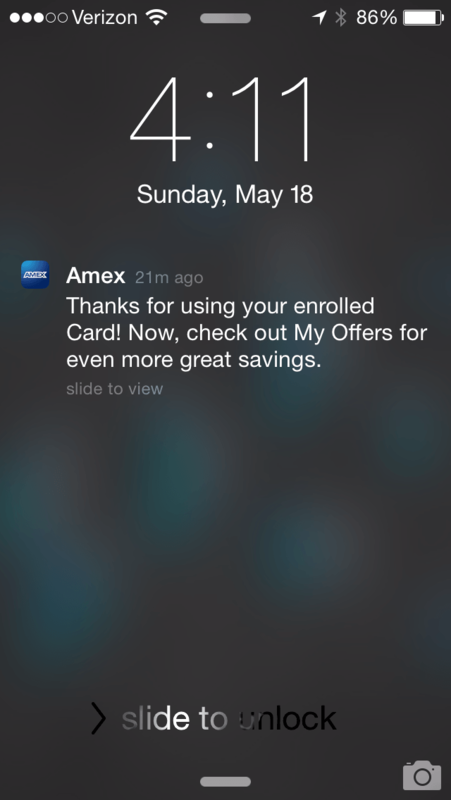 That’s good news, but it doesn’t guarantee you met all the Amex offer requirements. It only confirms that you hit the spending requirement. If you bought an e-gift card at Crate & Barrel with this offer, you would get the same notification but you wouldn’t get statement credit. Make sure you go through a portal when you make these purchases, to add a little more profit into the mix. From my experience, Amex is pretty quick about applying your statement credit (about 2-3 days). However, it can take up to 2 weeks. Now all you need to do is go to Gift Card Granny and sell it. Easy Peasy. Again, this can take a while depending on how you sell the gift card. If you sell it by typing in the code, it may only take 3-5 days. If you mail it in, it can take a bit longer. You don’t have to buy gift cards online, you can buy them in-store as well. Some stores do not sell gift cards online, so this may be a requirement. If you have a purchase that could use a certain Amex Offer, I would suggest using it for that rather than a gift card.